Photos courtesy of the Andrew Low House. The Cathedral of St. John the Baptist. Photo by Andrea Six. 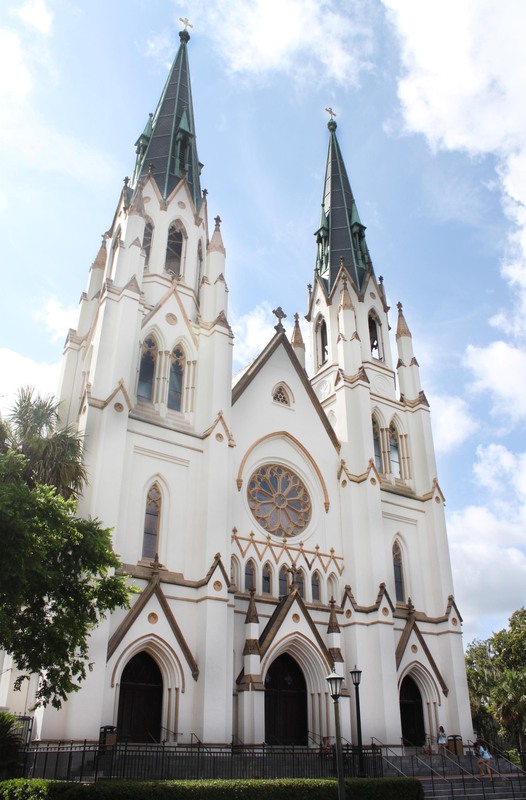 Lafayette Square is home to the ornate Cathedral of St. John the Baptist, which has the highest twin steeples in all of downtown, designed by architect Francis Baldwin. 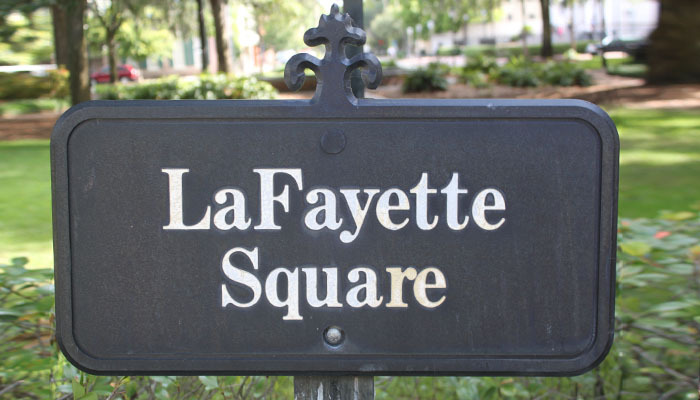 The square was laid out in 1873 and named in honor of the Marquis de Lafayette, a French general under George Washington during the American Revolutionary War. 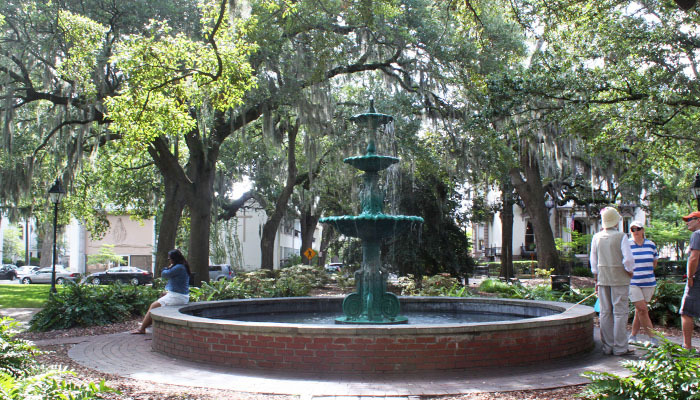 The centerpiece of the square is the Semiquincentenary Fountain that the Colonial Dames of America presented the city with to commemorate the 250th anniversary of the Savannah’s founding. 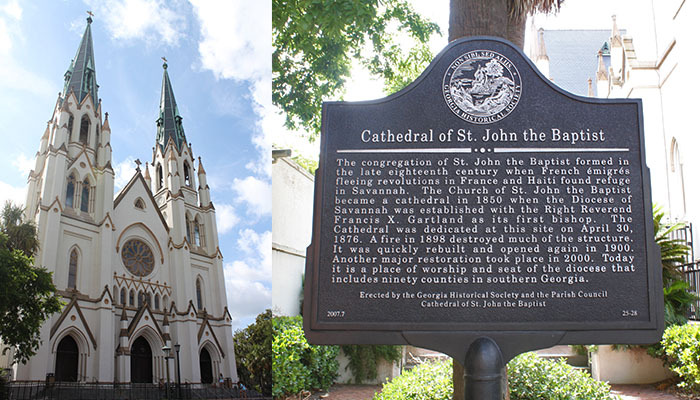 The Cathedral of St. John the Baptist, located on the northeast corner of the square at East Harris and Abercorn streets, was constructed from 1872 to 1876. 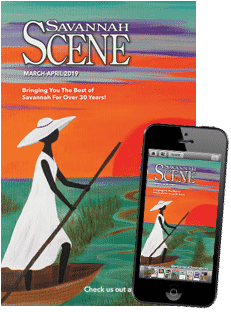 On February 6, 1898 a fire destroyed the entire Cathedral except the outside walls and spires. The restoration and rebuilding began immediately and one year later, on December 24, 1899, the congregation celebrated with their first mass. 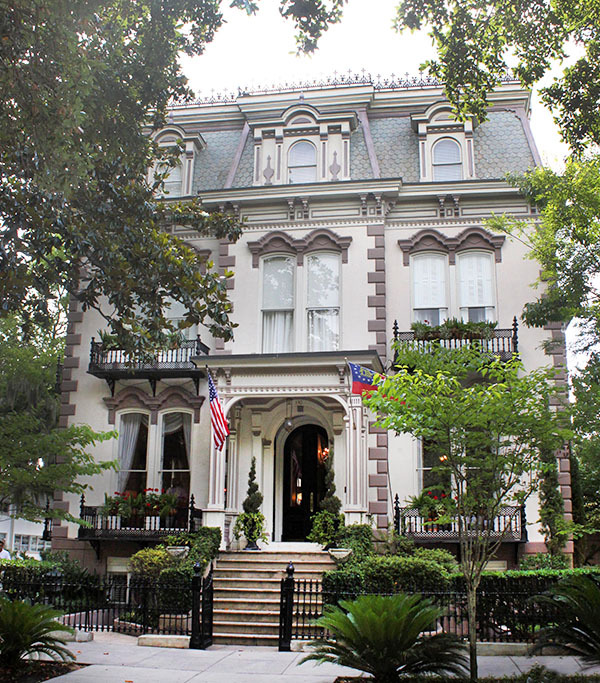 Christopher Murphy, a Savannah artist, led the intricate design work for the interior, which was not finished for 13 more years. In 2000, an extensive exterior restoration took place – the replacement of the slate roof. Hamilton-Turner House. Photo by Andrea Six. Opening up to the square is also the Hamilton-Turner House, which was built for successful businessman Samuel Pugh Hamilton in 1873. 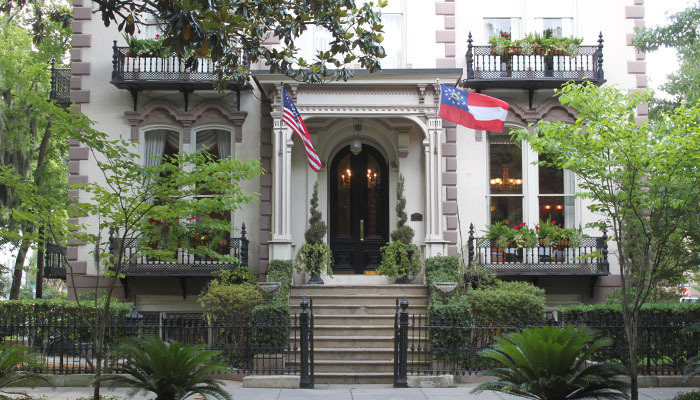 In 1883 this mansion became the very first residence in Savannah with electricity in Savannah and today guests can stay inside this magnificent mansion, as it is now a bed and breakfast, the Hamilton-Turner Inn. 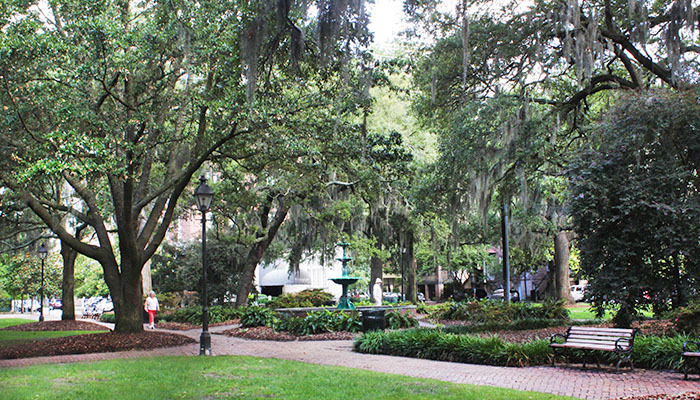 Also on the square, the Andrew Low House was built for Englishman Andrew Low in 1849 and designed by John Norris. Andrew’s son, William, married Juliette Gordon Low, the founder of the girl scouts. 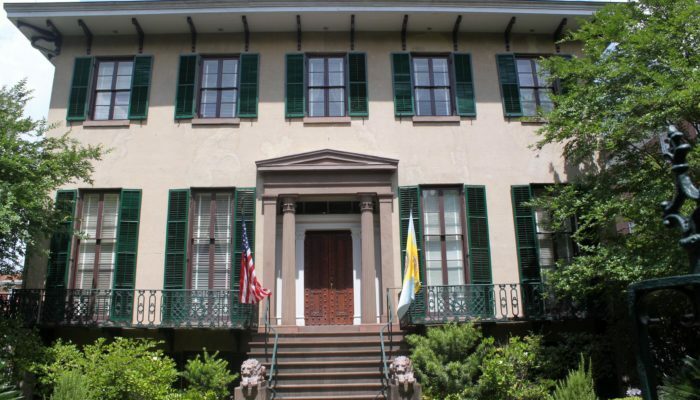 The National Society of Colonial Dames now own the house and it is open to the public as a museum.